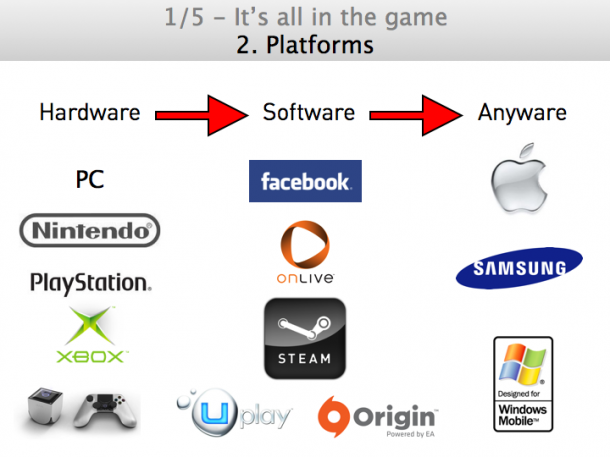 Since I will be speaking about games, gamification, applied games and my book the upcoming two days in Istanbul I might as well share this slide about the evolution of game platforms, also because the most recent addition to platforms can be pre-ordered per direct. The Game Stick that works with a controller and a USB stick is a sheer novelty! 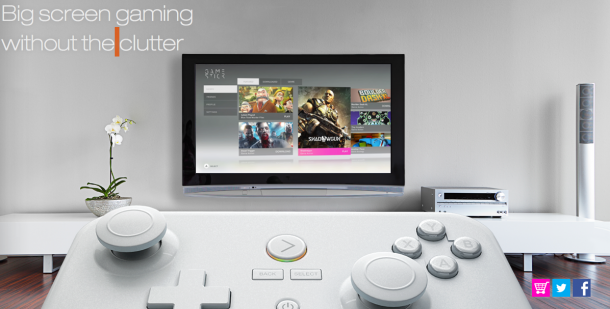 Although they (Ouya, Gamestick, Onlive) still have to prove their success I am really curious if they will change the way we will play our games in the living room. Yesterday I tweeted that Apple will introduce the ‘next gen’ game console in a form called ‘Apple TV’ probably this year. 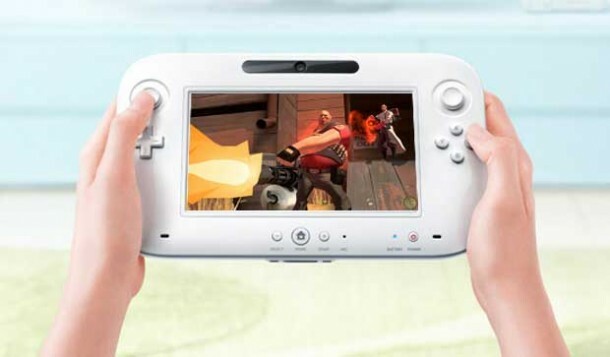 Providing gameplay through their iPhone, iPod Touch and iPads as controllers. How great it may sound, personally I still prefer controllers that have buttons. And what will Sony introduce along with their PlayStation 4…? Indeed – touch screen – in between their two sticks. Another mistake in my opinion. They could better have made their buttons even MORE analogue. So I can use the buttons as a ‘gas pedal’, or for sneaking (pressed slightly), walking (pressed normal) or running (pressed all the way). I advice the traditional companies to stick to their competences and optimize their systems in line with their own vision to keep hold of their fan-base instead of trying to become a ‘all in one- product… Stick to the Core I say! And let the young innovative companies try to shake up the world with novelties like the Game Stick…. For people that don’t know, please bare in mind that Nintendo was founded in 1889…, not 1989 ! It’s incredible that they have been innovating ever-since, sometimes revolutionizing the world with play. >It’s been a while since I wrote a full article myself, but here we go again! – I am trying to do this every morning now starting today (although it is hard to find inspiration sometimes). 18 months ago I started my own company called BrandNewGame and since then I have been working on great projects for ABN Amro Bank (confidential), Air Cargo Netherlands, Dutch Customs, Schiphol Airport, The Port of Amsterdam and Holland Casino (confidential). All great projects where games were used to influence behavior in all sorts of ways. This is one of the reasons I wasn’t able to write so much from time to time, but I am still very happy and very proud of the thousands of unique visitors that visit my weblog each year – I thank you for that! If you have any comments or ideas for this blog, please share them by email, Twitter (@BartHufen) or on my group on Linkedin called BrandNewGame. Twitter probably works best as I get a lot of spam theses days by email. Now, let’s have a look at the Top 10 games of today (thanks to http://www.vgchartz.com)! 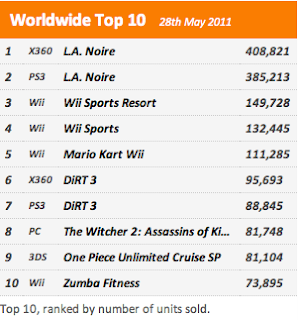 I must say I am still happily surprised that games like Wii Sports Resort, Wii Sports and even Zumba Fitness (10th place) are still selling well! This means women (mostly) are still using the Wii actively to do their workout at home in front of the TV, instead of going to the gym! I hear this a lot from friends around me. I am not sure wether this is consumer generated or successfully seeded by Unilever / Rexona…, but it looks great!